This summer was the 30th Anniversary of Ghostbusters, and the movie was re-released in theatres for a limited 1-week run. I took my son Andreas (age 8) to it, and he loved it! Mind you, he had heard of Ghostbusters plenty of times before from me, and had even played the games (PC and Commodore 64 versions) a little bit. 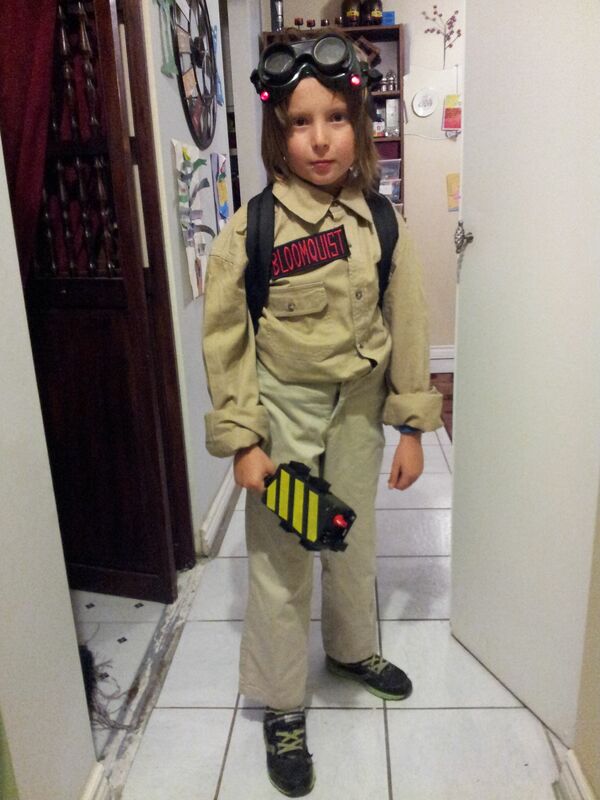 But seeing the movie clinched it: He wanted to be a Ghostbuster for Halloween this year! 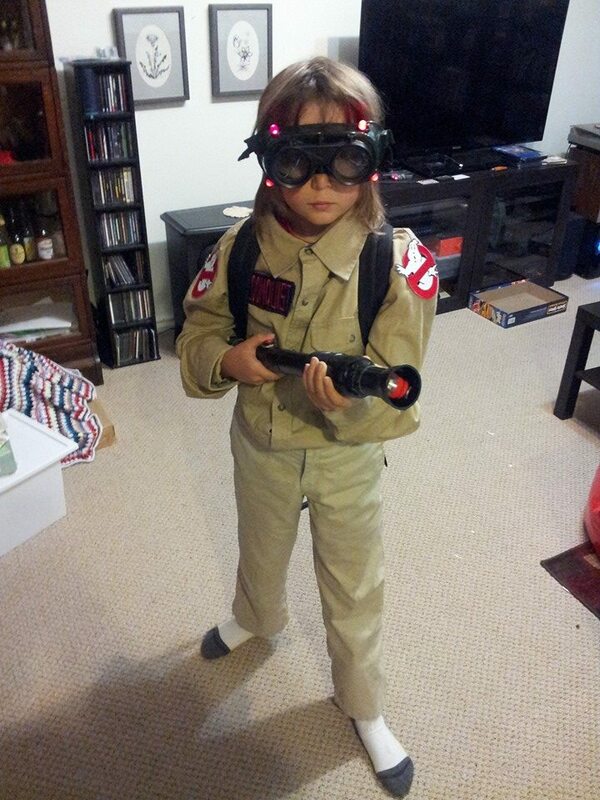 That’s music to a geek dad’s ears, so we spent a weekend putting together the ultimate Ghostbusters costume – on a limited budget. Half the fun was scrounging through the amazing surplus and electronics stores around Toronto like Active Surplus, Creatron, and Sayal Electronics, looking for doodads and gizmos to incorporate into the costume. We simply drilled a hole for the screwdriver, stuck it in and held it in place with some duct tape. Glued the heatsinks to the side, drilled a hole for the LED and connected it to the CR2032. I found the yellow caution pattern on Google Image search, printed it in colour and attached it to the top with double-sided tape. The Costume The costume was also very simple. In lieu of a “jumpsuit” we found some tan slacks and a shirt at Walmart. The nametag is proof that you can find virtually anything on the Internet (at least eBay) – there’s a seller who makes and sells custom Ghostbusters nametags with the original font! I ordered one for myself too! Similarly, the “No Ghost” logo patches are readily found on eBay and elsewhere. I had previously made these goggles for an unrelated costume, but they rounded out the look perfectly. Again, very simple, I took a pair of flip-up welder’s goggles, ripped off the ventilation ports and stuck in some 10mm LEDs (the holes were exactly the right spacing, how about that) with a CR2032 battery holder tucked inside, with the LEDs wired in parallel. An Arduino Uno I had kicking around, used to control the LEDs. The code is super simple, but here it is on GitHub. I had an idea to wire up the button on the neutrino wand to control something or other, but I decided that was overkill. 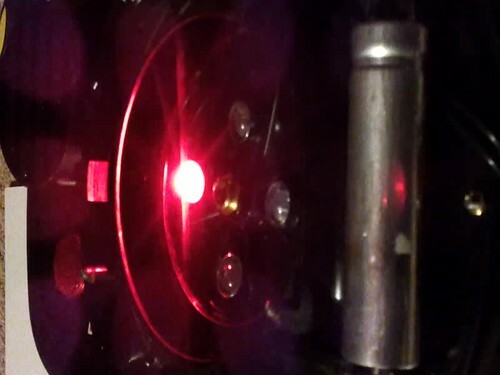 An old vacuum extension, more PVC pipe, and a red pushbutton for the neutrino wand. It “connects” to the main pack with some flexible electrical conduit. I cut the backpack in half to use the straps and backing, and just krazy-glued the lid of the Rubbermaid container to it (perfect fit!) We spraypainted the main part of the container and the various other bits, and while the spraypaint dried, we stripped the actual motor out of the blower. Once dry, we glued everything on and drilled some holes to put the case onto the container with the existing mounting screws. We drilled holes and stuck the 4 LEDs into the back and wired them up into the Arduino. The CPU fan and Arduino run off the 9V battery – the CPU fan gives a nice hum sound to the whole thing, and looks cool. The neutrino wand attaches to the side of the pack with tie straps and velcro so it’s easy to take on and off. 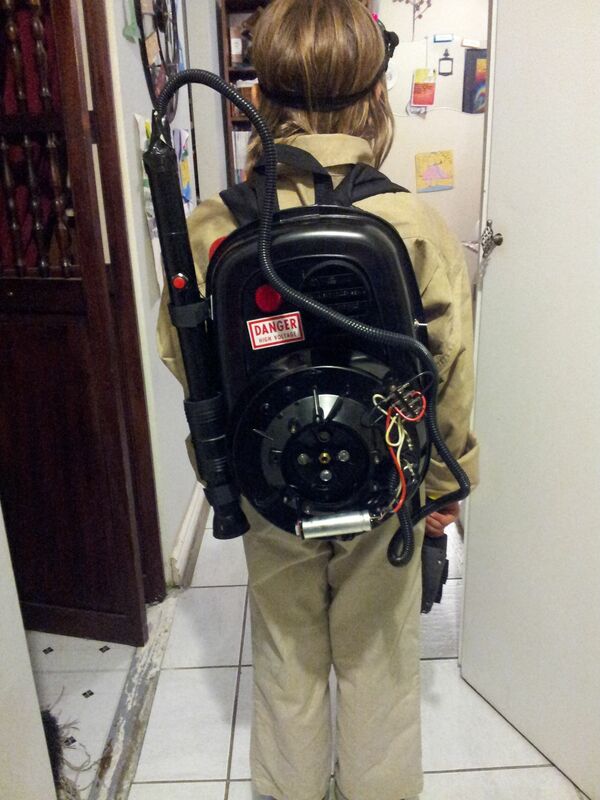 Here’s the almost costume, and a video of the LEDs doing their sequence. We took a few photos along the way, despite our excitement to get the costume finished. Enjoy! Copious amounts of duct tape!